LOVE this shot. Whatever this is has such a neat design, and I love the view in the background. Jealous... :) thanks for stopping by. That is a great shot but I'd never get it myself!! Great shot! Thanks for hosting and Happy WW! Way cool! And sooo big! Wow! That is from some dizzying height! Wow...I feel dizzy just looking at that!! cool shot! Wooah that looks so exciting!! Enjoy your trip to Vietnam! 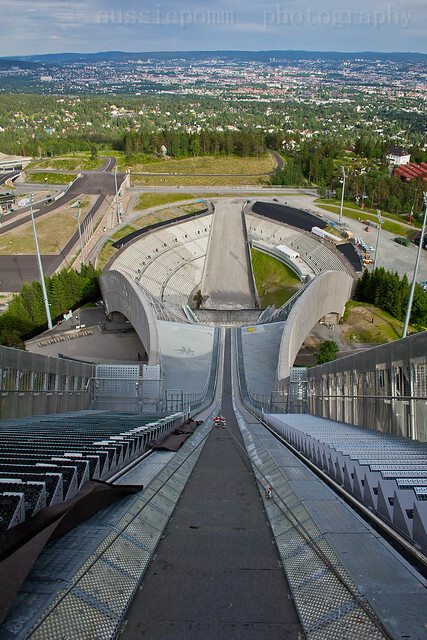 I always thought ski jumps looked nutty. But looking from the top down it's even nuttier! Great photo. Goodness! That looks terrifying and exhilirating, all at the same time! That's a really dizzying view. I leave it to the youngster, hahha. Gosh, I'd be so terrified to stand at that point. My fear of heights has taken over me completely. Very impressive. From this view, I have an appreciation of those skiers who can make this jump. A cool shot, though definitely NOT a sport for me. No doubt magnificent view of this spectacular slide jumps, I like. Greetings. Not sure I'd embark, but it does make for an awesome picture! Holy cow that is awesome! Oh my goodness! That makes my stomach fill with butterflies! Thanks for visiting my blog. Great shot, but yikes it almost gave me vertigo!!! Oh My! It looks like a theme park thrill ride! Wow. How amazing is that! What a view for the athletes, although they probably don't really look a round before their jump!! Ski jump? I think I will watch. lol - That looks a little scary. oh wow!!! but I'll pass :) I'm kinda afraid but for sure my husband will love it! 2012 AFL Grand Final - Well Done Sydney Swans!! What a rip-off (not to mention, BAD service!)!!! !